I love going to writer’s conferences. I always come away ready to write with ideas on how to improve my writing and market it both to potential publishers and readers. That said, I’ve learned that before I follow any of the advice that I receive at a conference, I need to test the fit. X, Y or Z might have worked perfectly well for the writer giving the advice, but that doesn’t mean it will work for me. Writing advice is not one size fits all and what worked for a Big-Name author may not work for me. Speakers at writer’s conference are generally “high end.” These are established writers. They are big names. They have status. Unless you are secretly Suzanne Collins, you and I may not have the clout to pull off whatever it is that Big-Name-Author managed to do. Let me demonstrate with an example of interest to many – self or independent-publishing. Do you have a comparable following? I don’t mean in terms of enthusiasm. I’m talking numbers here. Is your name your biggest sales tool? Unless people talk about “the latest (insert your name here),” you should probably answer no to this question. Have you honed your writing skills to the same level? Write enough to have a pile of books with your name on them and you are going to get better. Have you improved that much already? If not, you probably need an editor whose recommendations you can’t just brush off. If you answered “no” to even one of these questions, following the self-publishing path probably won’t lead you to the same destination. I’m not picking on people who chose to self-publish. Any advice that you receive from a name author needs to be considered just as carefully. Whether this advice concerns dealing with an editor or agent, following a publisher’s guidelines or dealing with the public, consider the advice carefully. 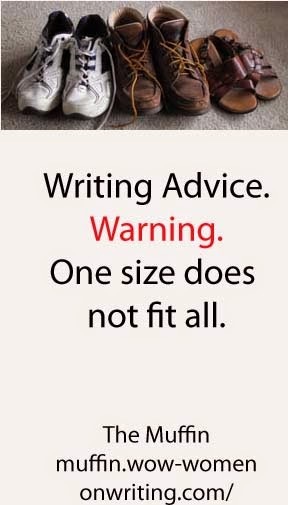 The advice may be perfect for one writer but not another, because writing advice is not one size fits all. Sue--Great post. I think writers need to be honestly self-aware. In reality, how good is their book? How appealing? How wide of an audience does it really have? Amen! I've been saying the same thing for the last year. I think it also depends on your genre and audience too. Thanks for this realistic post! If we don't realistically evaluate where we are and what will get us where we want to go, we'll end up nowhere special. A tough lesson to learn.